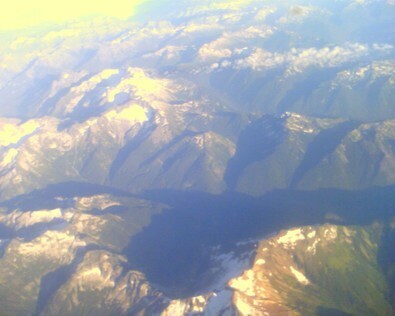 So, here I am… somewhere over the Canadian Rockies, chasing a late afternoon sunset. It’s the fist leg of a long “red eye” scheduled to get me home in the morning. I’ve been gone a week… again. Not complaining mind you, I’m just looking forward to sleeping in my own bed, mowing my own grass, chasing my dog around the yard and my wife around the bedroom. This isn’t about my to-do list really. It’s more about stopping to smell the roses, enjoying the moment. Or, maybe it’s just about nice people who work for nice companies. Does it really take that much to be nice? After another long week of being on the road, I’m looking forward to making my way home. So, in North Dakota this week, yes, I got another ticket. How bad? I was going 7 miles over the speed limit. Are you kidding me, North Dakota?… Seven miles over the limit?! Oh well, I was willing to take it with a smile. After all, I’ve earned / missed my share of tickets that should have been much higher. But, it’s not the 7 miles over, it was Officer Friendly’s insistence on being a jerk. C’mon. It’s a $35 ticket! Write it, tell me to have a nice day and welcome me to North Dakota. But no… Not this guy. He was calling every officer friend he knew to see if he could bust me on this… or that. Nope. I was clean as a whistle …just a little heavy on the accelerator, that’s all. Later that day, I’m hitting the Canadian / US border at Portal, ND. It’s a quiet sleepy town and happens to be one of the least busy borders I’ve crossed. I’m guessing here 99% of the people the cross the border are just average everyday ‘Joe’s’ — abiding by the law and getting by the best way they know how. So, why is it that we have to play 50 questions about my life history? Questions that have nothing to do with the situation. Have I ever had a felony? That would be a good question. No one asked that, though. Instead, I got: Why are you alone? How do you know the people you are going to visit? What are you doing with them when you are there? Oh, Canada… get a life! Oh, I don’t blame just Canada. Lynnette and I actually watched a US Border officer ask a guy when was the last time he got arrested? He said never. The officer said are you sure? This guy turned white as a hospital bed sheet and started to mumble and suddenly felt compelled to confess all this sins on the spot. We felt bad for him. Turns out he had never been arrested and the guy was just having ‘fun’ with him. Or rather, trying to trip him up to make him confess things on his own. Mind you this guy was a middle-aged guy, probably going on vacation. Welcome to the land of the free and home of the brave. Wait… I had a point here. Alaska Airlines / Horizon Air. The first leg of my red eye tonight. With my trusty Canon camera packed away, I had to break out the old camera phone instead. Keep in mind, I have no idea how to use it and I knew there was no way that it would do any justice to the scenery I was witnessing firsthand. This is Horizon’s A400. Not your every day luxury airliner. More like “the quick bus to Seattle”. But flying low offers great scenery. The best part about my first Horizon Air trip is that I found out they offer complimentary beer and wine. Yes, that’s right. Red wine from a Washington vineyard and Red Hook micro brew offered for most of the 1 hour and 45 minute flight across the Rockies. The ‘Skytenders’ were friendly. The seats were cramped. And everyone was happy. I like nice people. I renew my promise to be nice to regular everyday people in regular everyday situations. Gate B11, Seattle-Tacoma airport. Just 2 more hours until I board Continental Airlines. My guess is there will be no free adult beverage. Let’s just hope the in-flight movie is good and the flight is empty so I can stretch my legs a bit. No such luck I am sure. Hey Lynnette… Start the lawnmower, let the dog out and turn down the bed… Daddy’s coming home.